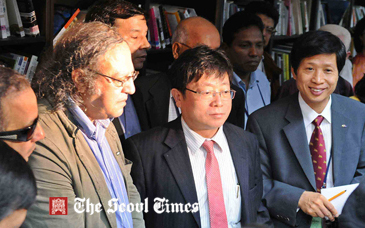 AJA President Lee Sang-Ki (center), AJA Vice President Kang-Seok-Jae (right), visit the YTN headquarters in downtown Seoul on October 8, 2008 to drum up the AJA's support for the television network's labor-management issue. At left is Jim Boumelha, president of the International Federation of Journalists. President Lee Sang-Ki of Asia Journalists Association (AJA) will host 2009 AJA Forum in Seoul on Dec 1-4, 2009. A total of 34 journalists mainly from Asian countries have been invited to the global journalists’ forum. A number of South Korea’s political, social, and opinion leaders will also take part in the forum. Among the local partipants are South Korea’s National Assembly Speaker Kim Hyong-O, ; Mr. Sakong Il, chairman of “G20 Summit Prepatorary Committee; Mr. Kim Hak-Joon, chairman of mass circulation daily DongA Ilbo. Iranian winner of Nobel Peace Prize Shirin Ebadi will give a special lecture at the forum. The Iranian human rights lawyer was awarded with Nobel Peace Prize in 2003 for for her significant and pioneering efforts for democracy and human rights. Ms. Jacqueline Aquino Siapo-De Araojo, the interim first lady of East Timor, will make a key-note speech at the forum. As a professor she now teaches at Seoul National University’s Graduate School of International Studies. AJA has been hosting “AJA Journalists Forum” annually since 2006.